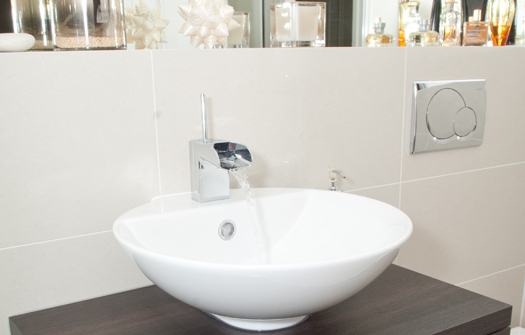 The guest bathroom or downstairs cloakroom are often places where you can afford to indulge in little touches of luxury. As they don’t get the same level of heavy use as the main family bathroom, this is the place where you can add opulent touches and adventurous design details. By offering your guests a dedicated bathroom of their own, you are not only showing what a considerate host you are, but also retaining a little more privacy for yourself when friends and family come to stay. 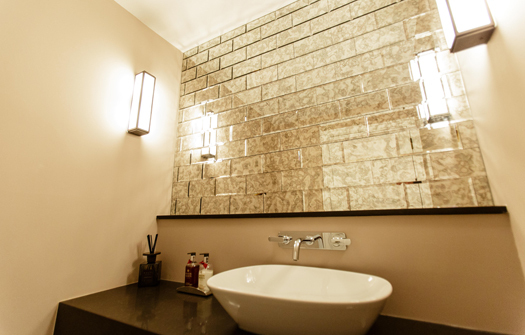 If you have family overseas who tend to come and stay for longer periods, a guest bathroom can be a real boon. You may think that your home doesn’t have room to fit in a guest bathroom, but by using compact fittings and clever design, you can fit a shower or bathroom into a surprisingly small space. We have often converted cloakrooms into guest bathrooms to give families additional facilities for visitors or a growing family. By building in tall, narrow storage for sponge bags, guest towels and toiletries, you can gain plenty of storage without taking up too much floor area. Adding luxurious touches such as shimmering tiles or glass shelves, you can lift even a tiny space from the everyday to the extraordinary.